Joseph Davis was born about 1842 in Jackson Co., Illinois, the son of John Davis and Mary Russell. According to military records from the NARA, Joseph was 6'1" tall with light hair and a fair complexion and was a farmer by trade. 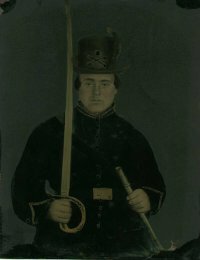 Joseph enlisted on the 23rd of November in 1863 and was mustered into Company E of the 21st Missouri Regiment at St. Louis,MO, on the 25th of November 1863. He died 9 April 1865 at Fort Blakely, Alabama and is buried in the Mobile National Cemetery in Mobile, Alabama. Biographical information was generously provided by Joel Russell .